Biting the head off a four-inch grub comes with a unique set of challenges. These wrinkly white insects—offspring of the Rhynchophorus palmarum beetle—have viscous guts the consistency of melted butter and stringy skin that sticks in your teeth like cooked celery. 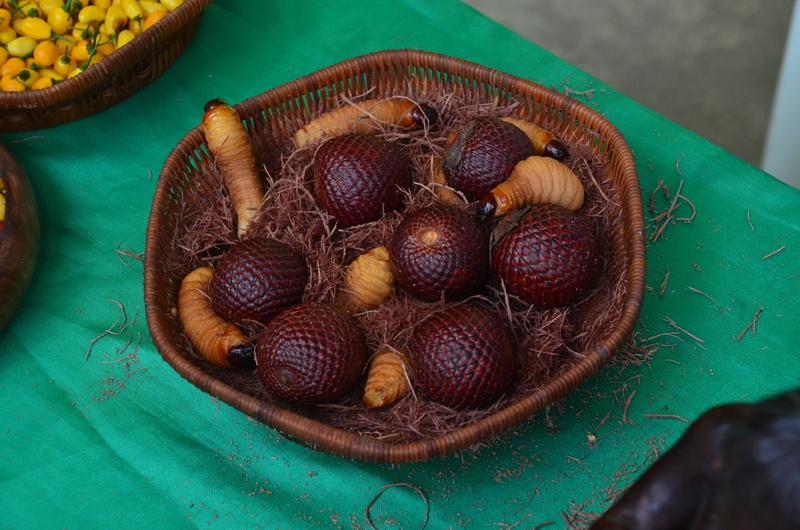 In the rainforest cities of Peru, locals call this grub suri and consider it a delicacy. As an after-dinner snack one evening, I purchased a couple from a street vendor, their plump bodies impaled on a skewer along with two lightly fried chunks of plantain. Severing head from body is a process best avoided on a date night. Upon first bite, I only succeeded in popping the succulent pouch and dribbling oil all over my shirt. Then a chunk of suri wedged itself between two molars so I gave up chewing and just slurped the thing down spaghetti-style. It tasted like melted butter. Suri begins its lifecycle inside decaying palm trees, where the Rhynchophorus palmarum beetles lay their eggs. And these days, there’s a surplus of fallen trees available for expectant beetle moms. That’s because Peruvians are rapidly cutting down palms, known as aguaje, to make quick cash selling the fruit, leaves and wood. But what’s good for baby suri is bad for the local economy, contributes to climate change and reduces genetic diversity within the region. Destroying rainforest for commercial gain is unsustainable and could potentially upset entire communities, experts say. “Aguaje is one of the most common plants in the forest, so people have an idea that it can be cut down, and it’ll always be there, but we’re already seeing scarcities,” says William Park, the co-founder of Acaté Amazon Conservation, which runs rainforest conservation projects.